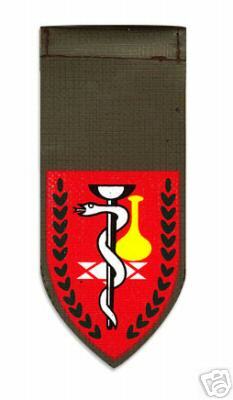 IDF Medical corps laboratories Tag. Typically, each IDF unit (yehida) has its own shoulder tag. Shoulder tags consist of a long section and a tip, which can be one of four shapes: a circle (commands, directorates and air force units except anti-aircraft), a square (Golani Brigade), a diamond, or a shield-like shape (most common). The Israeli Medical Corps is an Israel Defense Forces corps responsible for providing healthcare services and medical treatment and instruction to all levels of the IDF. During wars or emergencies, it also assumes authority over the civilian healthcare system in Israel. The corps attends to the planning, organization, and supervision over the preparedness of the healthcare system to face crises. As of 2007, the corps is headed by Brigadier General Dr. Nachman Ash. Its headquarters are located in Tel HaShomer.